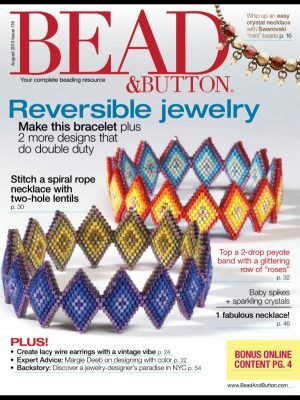 Whilst reading this issue it reminded me of the different reasons I like to bead and including why some patterns appeal to me more than others. When doing project from magazines be brave and choose your own colours, there are millions to choose from and it can be hard to get the exact colour mentioned. Some of these mention the colour codes which you can search for on the site, but if it’s not there, look in the colour categories for something that takes your fancy. This is quite an attractive colourful bangle. 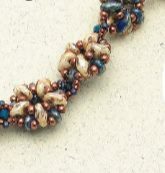 You can clearly see it’s made with Delica beads and looks like peyote stitch, but also could be brick stitch. I’ve made diamond shapes in the past, but this is double sided, so thought I’d take a closer look. I was pleasantly surprised at the technique used to make this. First confirming it was indeed Peyote stitch, however boths sides are worked at the same time, and as long as you use contrasting colours it should be easy to get started. The bangle is worked from the side of one point, increasing to the top and bottom points then decreasing to the other side, then you start the next diamond. I thought this was a great way to stitch this, both sides at once, great idea. 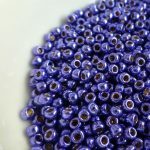 Check out the Delica range to get started, you also need a handful of size 6 beads too, but no doubt you have some in your bead stash – the colour doesn’t matter. Have fun making this one and feel free to post any photos on our Facebook page, or email them to me with permission to publish. Another double sided bracelet that is appealing to the eye. 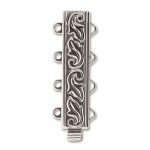 It’s made of circular components that are joined together to make the bracelet. The bonus here is that one component makes a great earring too. You’ll need twin super duo beads, some 11sand 15s and some 3mm bicones. You could substitute the bicones for a 4mm fire polished bead I would think, as it’s not in a critical position. It looks very easy to put together, and pretty quick too. I am going to test it out to see if twins will work instead of twin super duos. I love these, but alas they are made with wire. It might not be beyond my abilities, but I am not great at making wire projects neat, give me thread any day. 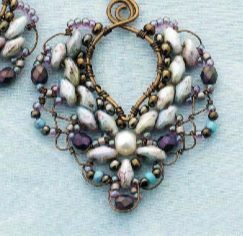 If you want to make them I stock all the beads and you can get a great wire selection from Kay’s Articles. I noticed this one as it uses the two hole lentils, what a great idea. The lentil forms the core of the double spiral, so you get two holes to work from, one for each set of loops. I also like the way it’s only the front section that’s a spiral, the back carries on with the lentils and seed beads only. As well as the lentils it uses 8s 11s and 15s, plus 4mm fire polished and a 4x6mm glass pearl. However if you can’t find the pearl, just use another 4mm fire polished bead. 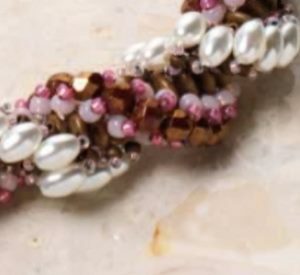 You’ll have to adjust the size of seed beads if you don’t use the pearl, so just make it the same as the other loop using the 4mm fire polished bead. Would love to see this in some other colours too. Loved the look of this, but then I am drawn to anything purple and green. At first glance it looks simple, but the thread paths will need a bit of concentration to get right I think. Love the way the superduos are used at right angles to each other – good and different use of them. Editors note mentions you can swap them for twins, so good to know. You’ll also need 3mm bugels, 3mm magatamas 11’s and 15s and 4mm bicones. Bicones are used between the components, so as long as you use something the same height, you can substitute those. This pendant caught my eye as it has small spikes in it. 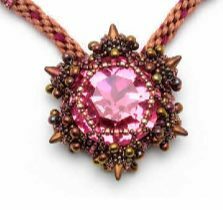 The strap is made from braided kumihimo with beaded embellishment on it and a beaded toggle too. Great combination of techniques. I really want to make this pendant though. You can either use the big 27mm crystal stone or you can use a 30x22mm cab, or even a 27mm button – oh so many choices ! 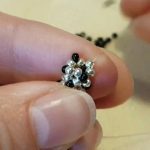 you’ll also need some drop beads,(this ones asked for are 3.4mm drops) 11’s 15’s Czech 15 charlottes and of course the spikes. 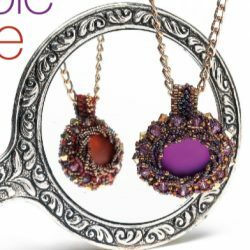 This one might take a bit of work, but I think only doing the pendant might be a quick short cut. 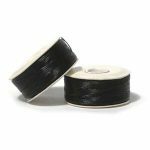 There is no rope with this one, but you can improvise and whip something up to match if you want. This project uses the beautiful Lunasoft Cabs, and you use one on either side to create two different looks. Some neutral bronze coloured seed beads have been used which I always say go with anything, great idea when you are stuck for colour choice. As well as the two cabs you’ll need some seed beads in size 15 and some Delicas plus 4mm bicones, and it might be better if you use those, but I might try it out with 4mm fire polished beads instead to see if the substitution works. You can also use other cabs, not just Lunasoft, anything 25x18mm should work ok. It looks like this will take a bit of concentration, but nothing to tricky. I especially like the front twisted feature on the cabochon face, great idea. There are several more project in the magazine that I’ve not mentioned, but these are my favourites. 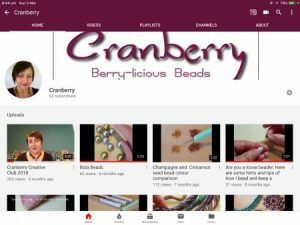 Hop you have enjoyed reading this and find it useful aid to beading your projects. In stateing what’s needed for the projects, I’ve ommitted anyclasps, findings and notions needed. Please check out the full magazine available from Kalmbash publishing, you can purchase it electronic version or in paper format.